Real-time encoding software which offers the option of a multi-input and multi-output formats, directed towards 24/7 continuous operation live streaming or events. 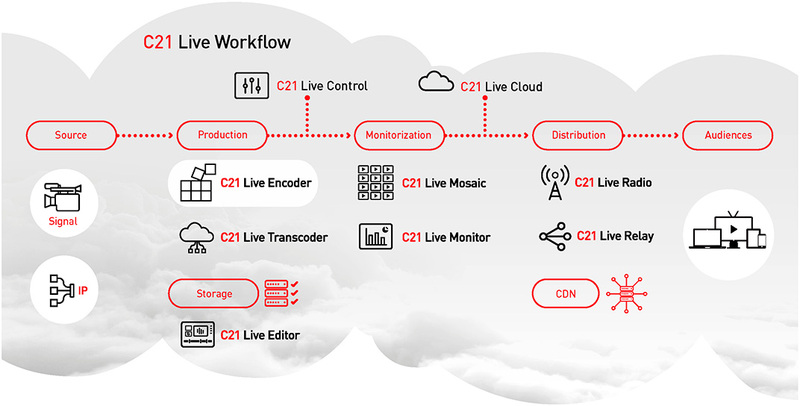 Moreover C21 Live Encoder has been designed to be integrated with the most important live streaming services and CDNs in the market. C21 Live Encoder allows the simultaneous acquisition, encoding, recording and publishing of multiple input signals makingit a top quality solution with endless possibilities. Adaptive bitrate of top quality and performance. The possibilities of encoding multiple video sources in different formats with multiple bitrates, provides a perfect effort-to-result ratio. Continuous broadcast signals recordings as source or transcoded format. Any one or all bitrates. ffers the possibility of selecting the different components of the recording, such as one or more audio tracks, subtitles, EPG or teletext for editing in VOD, legal copy, quality assurance or Catch Up TV. The options of integration with external storage systems allows to define the different destinations for the recordings as required. Advanced content processing . The ability to insert elements in the content in real-time, such as timecode, logos, overlay, blackout.Source switching, cropping and deinterlacing among other features. Virtualization support. Softeware virtualization allows for quick setup on client hardware or on private cloud. Software, cloud based and appliance editions. Adjusting to the customer´s needs with options ranging from pay-per-use to the purchase of perpetual licenses. Continuous operation with 24x7 support or Premium support service that adapts to the requirementsof any live event. Integration with CDNs and live streaming services. Add the option of doing at the same time the live broadcast and VOD distribution of the same event to different services. Encoding capabilities for the most popular codecs and formats available in the market. Each channel has a completely independent configuration to ensure the maximum quality and efficiency for audiovisual content broadcasting in formats such as Adobe HDS, Apple HLS, Adobe RTMP, Microsoft Smooth Streaming, MPEG-DASH or MPEG-TS. Versatility in product functionality. The ability to be used as encoder, origin server, recorder, decoder or playout together with the many possibilities of integration makes it a solid investment by adapting to the users’ needs. Intuitive web, API and SNMP management. Reduces the challenges of management, monitoring and integration with third-party systems. Integration with C21 Live Cloud services. Opening a new range of possibilities with the components of C21 Live Cloud: C21 Live Mosaic, C21 Live Monitor, C21 Live Editor and C21 Live Control. Diversity in the operating models. Based on C21 Live Cloud, SaaS o appliance service, it ensures an easy adaptability to any business model. The encoding service, C21 Live Cloud Encoder, can generate multiple qualities (adaptive bitrate) in multiple formats (transmuxing) from a single source of audiovisual content. The option of a private cloud enables a user to make use of the virtualized software as part of his own hardware resources, in order to have access to a cloud solution at the location of acquisition tothe point of broadcasting content, minimizing the initial investment. Encoding resources optimization: the option of activating only what is needed and at the same time changing the amount of encoding resources in real-time, opens an opportunity to new encoding projects in which the inversion would be, otherwise, impossible.